Everything I've done, I've done for you. The forces of Microspace descend on Earth after Baron Karza does the unthinkable to save his people. In Scotland, Scarlett, Rock 'n Roll, Snake Eyes, and Skywarp investigate a rural cottage infested by Dire Wraiths. Though Skywarp arrives to help, they’re intercepted by a mysterious portal and a diminutive craft that disgorges a platoon of Microspace warriors, overwhelming the ex-Decepticon and forcing him into stasis. As he strategizes the vanguard invasion from Microspace, Karza muses on his experiences within the heart of the entropy cloud and the years spent out of sync with the rest of his universe. Over the course of his long life within the space-time anomaly, Karza stumbled on the cause of the threat: the enigmatic Time Travelers, who had tried and failed to Enerchange with time itself. Eventually, Karza stumbled on the secret within the entropy cloud: a secret, he muses, that will lead him back to Earth. In Monument Valley, Optimus Prime, Jazz, and Arcee arrive at the former resting site of Autobot City to investigate a recent spacebridge fluctuation in the area. A repentant Optimus muses that if it weren’t for his annexation of Earth into the Council of Worlds, the crisis might never had occurred at all, a notion Jazz tries to disabuse his leader of. Arcee and Jazz argue as Prime realizes that their trip might have been in vain… but he’s interrupted from his philosophizing when a gigantic Baron Karza, wearing the Enerchanged body of Micronus Prime, makes short work of Prime's comrades before crushing the Autobot leader underfoot! Karza reflects on the enigmatic mechanical giant within the heart of their dying universe. Karza remembers his time within Micronus Prime’s colossal body, learning secrets undreamt of by his kind. It wasn’t until Karza finally enerchanged with the Prime himself that he finally understood the workings behind Micronus’ spacebridge: the key that unlocked a doorway to another world. But this power comes with a price—Karza can feel himself slipping away every time he merges with the body of his creator. But his taste of power has left him wanting more, and as Karza musters his army he notes that there’s only one last loose end to tie up: getting rid of the heroic Micronauts once and for all! Brad Turner's connections to the drug trade were established in M.A.S.K. #3. Julio notes that a search for Ore-13 went poorly for M.A.S.K. in Barbados, referring to their confrontation with Miles Mayhem in M.A.S.K. #1. He also quotes Admiral Ackbar's famous line, "It's a trap", just like he did several times in that issue. Karza previously made a trip to Earth as part of the original Revolution crossover, where he worked alongside Miles Mayhem as one of his main collaborators. Karza remembers his defeat at the hands of the protagonists of that crossover. Shazraella and Karza remember the latter's battle against Baron Daegon, which occurred in Micronauts #6. Shazraella notes that this battle was enough to crush the Ministry of Science, which was the main good(-ish) faction in the Micronauts universe. Karza remembers being lost for years within the entropy cloud, as he related to the Micronauts in Revolution #3. Micronus Prime was established as the creator of Microspace in 2016's Micronauts: Revolution one-shot issue, leading into the Revolution crossover where the heroes used his spacebridge to travel to Earth. Monument Valley was the resting place of Metrotitan, temporary base of Autobot City, and the site of the last big battle of the IDW universe: the big crossover dustup in Revolution. The leftover crater was created during this battle as Metrotitan transformed into his spaceship configuration and lifted off. Arcee recalls her and Jazz's battle in Portland, which occurred in Revolution #1. Karza has apparently gleaned some of Micronus's own knowledge from his repeated enerchanges with the Cybertronian; he notes that Micronus was apparently a god among "his people", but later "abandoned" them. This certainly fits with what we learned from Sentinel Prime in The Transformers #57; according to Sentinel, Micronus Prime ruled over Prion's colony world of Mini-Cons for some time before leaving via spacebridge and (presumably) creating Microspace. The Microspace ship that attacks the G.I. Joe crew is the Sharkos from the original toyline. Its barely-glimpsed crew can be seen to include a Kronus, an Antron, a Repto, and a first-generation Acroyear. One of the many alternate versions of Baron Karza glimpsed on page is based on the original 1970s toy. When Karza first arrives on Earth, Optimus swears by the Celestial Spires, a popular exclamation in the original UK Transformers comic. Julio Lopez's Jackhammer is mislabeled as the Rhino. The discussion of Rock 'n Roll's shotgun seems pretty confused: the dialogue seems to be saying it's a regular​ shotgun, despite it being clearly established as a Cybertronian laser weapon back in G.I. Joe #1, and on top of that it's drawn as his machine gun from the first half of that issue! As the Autobots discuss their culpability in the Revolution crossover, Arcee says Optimus has been infected by the "terrain taint". Given's Jazz's shock, it's likely supposed to read "Terran taint". Given that M.A.S.K. have already had their first confrontation with Miles Mayhem, but are still operating together, Wrath of Karza must take place in between issues #5 and #7 of that series, meaning that "Brad Turner" would actually be the shapeshifter Zartan — though no allusion to that fact is made here. 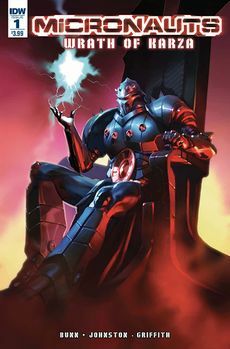 Regular cover: Baron Karza sits on his throne, by Alex Ronald. Subscription cover: Karza surrounded by mechanics, by Michael Golden. Retailer incentive cover A: Larissa and Phen, by Valentina Pinto. Retailer incentive cover B: Baron Karza, by Paul Pope and Lovern Kindzierski. Retailer incentive cover C: Colorless version of subscription cover, by Michael Golden. "The Hasbro Tribune" editorial page promoting April's Hasbro Universe titles, including G.I. Joe #5, M.A.S.K. : Mobile Armored Strike Kommand #6, this issue, Optimus Prime #6, Revolutionaries #5, ROM #10, Lost Light #5, and Till All Are One #9. This page was last edited on 7 February 2019, at 22:17.